Best Cheap Hair Clippers of 2019: Get the Cheapest Clippers with the Best Performance! A good job or a job well done in any task depends heavily on the right tools. For men’s grooming, you can get the best grooming only by using the right set of tools. But often, the right tools are too costly! Often we find the perfect tool for our needs, whether it’s a scissor or hair clippers, but the cost is too much! 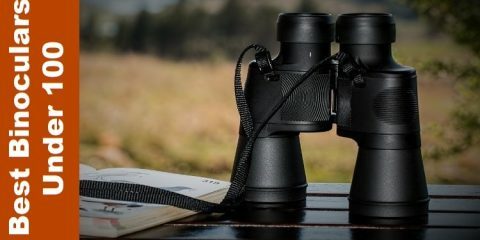 It’s true that there is wide variety of options available in the market, but most of the times the price of a tool is not justified by its price. Finding the best cheap hair clippers from all the available options is a tough task, to say the least. But we will make this decision easy for you with the reviews of our top picks! The technology, features, quality of manufacturing hair clippers in the modern times are better than before. Hair clippers are more user friendly, energy efficient and safe for use not only for professionals but also for amateurs. We have reviewed some of the best inexpensive hair clippers in the industry with all the features for a perfect modern-day haircut, that you can get without digging too deep into your pocket. Wahl is a brand which is among some of the top manufacturers of the grooming industry! The Wahl Color Pro Hair Clipper is definitely among the best in the Wahl brand of hair clippers. It is an extremely powerful machine with a long-lasting battery which is rechargeable for up to 60 minutes of superior performance. The Color Pro is not only rechargeable, it’s cordless or wireless operability allows it to be used easily on the go and for trips. It also supports dual voltage of 110 – 240 volts making it ideal for international use. It is attractively designed with colorful comb heads and is very easy to use. The sleek handle design complements the colorful attachments. It is an incredible set with 21 attachments with ideal settings for men, women, kids and even babies. The safe and effective clipper is a perfect tool for the entire family. As mentioned earlier, the color-coded comb heads make it easy to remember the sizes without having to shuffle through all the comb heads trying to read the small label for the size. It comes with superior quality stainless steel blades which are sharp and offer clean cuts. The removable blades are easy to clean as they are rinseable. 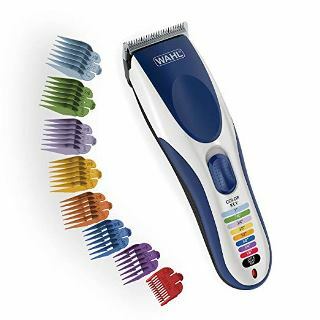 The Wahl Color Pro hair clipper is an excellent option with its colorful assortment of 21 attachments. 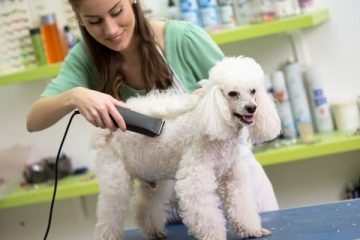 It has the unique setting requirements for every need such as cutting hair, trimming body and facial hair, detailing, etc. 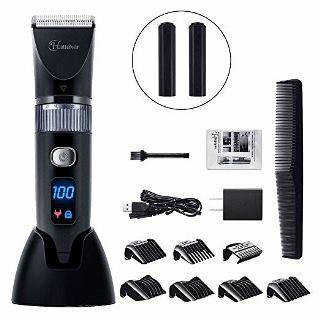 It is ideal for haircutting and beard trimming for the entire family as a great cost-effective solution with impressive performance. I think it is best for those who are looking to get a complete hair clipping solution for their household at an affordable price. 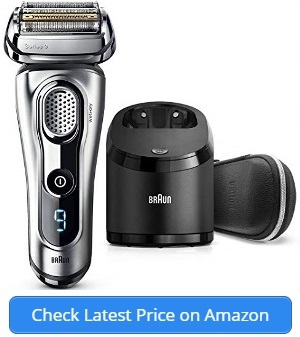 You won’t have to buy a separate trimmer, beard trimmer, detailer, etc. when you can get it all using the Wahl Color Pro hair clipper. Given its value pricing, the performance is not lackluster as it can compete with some of the best clippers in the market. The Wahl Color Pro hair clipper is slightly louder than most of its competition in the market. While many enjoy the sound of power, it can be quieter for ease of use. The Wahl Stainless Steel Lithium Ion Plus trimmer is a small tool with massive features. The lightweight and thin design of the clipper may be mistaken for below average power. But the stainless steel trimmer is a high-performance complete groomer for men. At the heart of this new Deluxe Groomer by Wahl is the extremely powerful Lithium Ion+ technology. It is capable of providing up to 4 hours of excellent run time. The motor carries twice the torque than most other clippers and a one-minute fast charging capability for three-minutes of use, in case of urgencies. These added power and features enable this incredible tool to deliver the best grooming solution in a sophisticated stainless-steel package. The Wahl 9818 Lithium Ion+ Stainless Steel Trimmer is a deluxe, new and multifunctional grooming tool which is a highly efficient machine. It is attractively designed to be simple yet, effective. Users of all ages will enjoy the all in one capabilities of the trimmer with the power to shave, cut, trim and detail. The run time of the trimmer is great due to the use of Lithium Ion + technology. 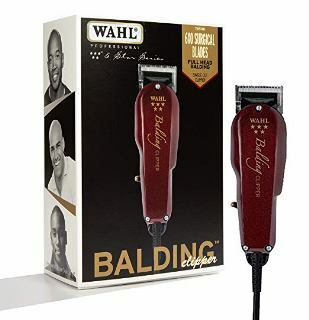 The Wahl’s patented blade design with its various sizes of heads and guide combs make it dynamic for all uses. There are 12 settings from 1/16″-1″ which allow grooming from head to toe. The quick charge feature is also excellent in providing 4 hours of use for only 1 hour of charge. The accessories of the Stainless steel hair clipper are not as sturdy, so the guide combs are easy to break from normal use. The Hatteker Cordless Hair Trimmer Pro is not just a hair clipper, but also a Beard Trimmer for men which is both rechargeable and waterproof. The machine uses professional, self-sharpening, ceramic titanium blades for sharper cuts on all types of hair. The waterproof feature allows easy detach for thorough cleaning. It is run by a powerful motor for maximum performance. The motor is durable and provides sufficient power for a haircut without any overheating or loud noises. It is powered by 2 rechargeable double AA batteries for up to 2.5 hours of cordless usage. The USB quick charge allows it to be charged in less than an hour for full charging performance. The Hatteker Cordless Hair Trimmer Pro comes with a complete package including the Hair Clipper, 6 guide combs and a hair comb. A cleaning brush is included for maintenance and 2 rechargeable double AA batteries are also included. The hair clipper is 100% waterproof for fast and easy cleaning under running water. An LCD display shows the charging status along with a lock symbol. The one button locking feature is displayed on the screen. Hatteker offers a complete haircutting kit for a budget price. It is capable of adjusting from 0.5 mm to 2.5 mm with an easy tune button. In addition to this, the 6 guide combs offer sizes between 3 mm, 4-6 mm, 7-9 mm, 10-12 mm, 16-18 mm & 22-24 mm for all styles of haircuts. It allows you to get various length hairstyles at the comfort of your home. It is recommended that the length is best adjusted to 2.5 mm for usage. The display must be cleared of the battery status before removing them for a fresh recharge. Also, when washing under running water, the battery is best left safely inside. The durability of the razor blade is not up to the same level as some of its similar priced competitors, since the build is from plastic material. The Wahl Chrome Pro is not just a clipper, it is a complete haircutting kit! The chrome pro comes with all the features you need for professional quality haircuts at home. It has a super heavy-duty motor which runs on PowerDrive for exceptional power & no snagging. The blades are made from premium materials with self-sharpening technology. The precision blades are able to cut through even the thickest of hair types. The clipper kit comes with a complete set of attachment guards. Also, it includes an adjustable taper lever for blending and fading. The 24 pieces of the clipper include clipper blade cover, 13 attachment guards, 2 hair combs, a pair of scissors, 2 hair clips, a barber’s cape, a blade detail cleaning brush, blade oil for lubrication and a convenient storage case with handle for easy carry. The chrome pro is a fully American made product with both made in USA & imported parts. It is based from Sterling, Illinois, USA. It is an amazing tool for those looking to save money and a handy gift for the men in your life such as dads, husbands, boyfriends, etc. The Wahl Chrome Pro is easily one of the finest looking and performing hair clippers out there in the market. 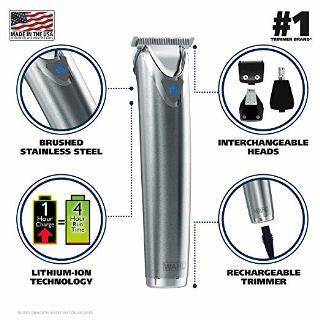 Wahl is the #1 brand of hair clippers and beard trimmers in the USA and in the Chrome Pro it has created a tool which is perfect for full body grooming needs. The hair cutting performance of the Chrome Pro is remarkable. The crisp cutting is due to the blades, which are the finest self-sharpening precision blades for long lasting, durable and clean cutting performance. Not only is the tool powerful, it is an excellent looking product. It comes with a comfortable grip for the rather bulky machine but it is designed with premium dura-chrome finish for an absolutely exquisite look. 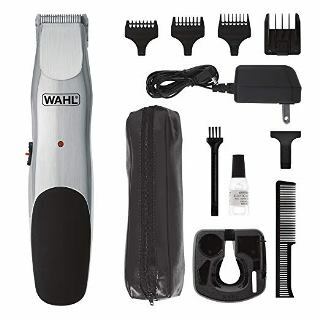 The Wahl Chrome Pro hair clipper is an excellent product for a value price but it is a corded device, which is a weakness in the modern times. It could improve as a cordless product. The Wahl professional 5 Star Balding Clipper is a barbershop quality hair clipper. It is run by an electromagnetic motor which is powerful enough to cut with double the power of pivot motors. It is a clipper which is capable of offering barbers and stylists an almost surgically-close cut. For this reason, it may be intimidating for the amateur home use. But the 5 Star Balding Clipper is quick, precise, and effortless on the skin, which is great for bald fades. As its specialty, it derives the name 5 Star Balding Clipper! It is accompanied by all necessary accessories such as two attachment combs, lubricating oil, a cleaning brush, an instructions manual, and the iconic Wahl’s red blade guard. The 5 Star Balding Clipper is fairly bulky and heavy clipper which is not powered by a battery, but only directly through the power cord. The cord is 8-foot long for maximum movement during use and made from professional grade, chemical resistant material. This clipper guarantees that you will get the cleanest bald fades just like any other barber or professional within the comfort of your own home. The Wahl professional 5 Star Balding Clipper is designed as a clean, modern, aesthetic tool designer with ergonomic principles. It is built to impress by its looks as well as its performance. The smooth steel base makes it attractive and the skin-friendly design is able to offer safe & comfortable hair clipping experience every time. The professional, German, titanium blades on the Balding clipper is made with self-sharpening design for long lasting, sharp cuts. It comes with a compact package of the clipper, charging base, AC adapter, 3 trimming attachments, cleaning brush and lubricating oil. A complete, compact hair clipper for a value price with decent performance. Truly, a great value for money product which will deliver results. The 5 Star Balding is a corded clipper, although a lithium ion battery is included. Although it has an 8-foot long cord, a cordless rechargeable version of the clipper will overcome this primary weakness. The Philips Norelco 7100 series is a powerful, cordless hair clipper which is powered up by a Lithium-ion battery. With its turbo boost, it is able to offer precise cuts from titanium blades which are adjustable for exact length of haircuts. Norelco 7100 is built to last and is guaranteed to perform. It is able to cut hair at least twice as fast using the DualCut Technology. Philips Norelco 7100 also support dual usage as a corded or cordless clipper. But it is able to provide the maximum power and freedom in both versions. It is run by a powerful Lithium-ion battery with back up of up to 120 minutes, after just a single hour of charge. The turbo boost feature gives increased power for cutting through thick, stubborn hair. The Philips Norelco 7100 is capable of providing 24 different length settings using just its one single comb. The design is for a hassle-free hair cutting experience using an adjustable comb. It is extremely easy to select and lock a length from 1 mm to 23 mm without the need for more than 20 different sizes of guide combs. 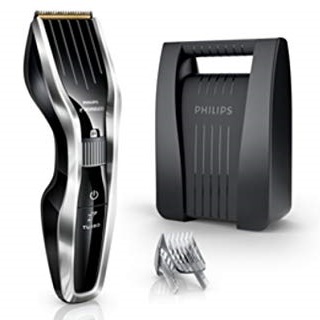 One of the most hassle-free and incredible features of the Philips Norelco 7100 is its ability to offer so many different length settings using just one comb head. It is extremely irritating to shuffle through countless guide combs to find the particular size when clipping hair at home. Also, the turbo boost feature is an effective solution to the time when the clipper is unable to cut through thick, dense hair. The advanced DualCut technology used on this clipper is able to offer enhanced cutting element with smart engineering. It cuts up to two times faster than other Philips Norelco clippers. It is also further strengthened by a robust steel guard for ultimate durability. A bargain clipper for excellent performance. Although the Norelco 7100 is a great hair clipper, it is not the best for short haircuts as hair can get snags, tugs, and pulls while cutting shorter lengths. The Wahl Groomsman clipper is a dual power trimmer which is capable of both cordless and corded usage. The rechargeable trimmer runs cordless using two double AA batteries. The trimmer uses high-carbon material for its precision-ground steel blades. The blades stay sharp longer and cut better due to the premium quality materials. The Wahl Groomsman cordless clipper offers not just hair clipping but also, beard trimming with 6 positions of a regulator. The ergonomic handle makes it comfortable to hold with soft-grip pads and a contoured body design. It comes with a travel pouch but also, has a travel lock which securely locks it for storage during travel to avoid incidents or accidents. The rechargeable Corded & Cordless beard trimmer has 3 different guide comb attachments for blending hair at different lengths. The charging capability of the beard is excellent and it can hold its charge for up to 2 months after a charge. In addition to this, it comes with separate guides for every setting of beard trimming such as a Stubble Guide, Medium length Guide (1/8 inch), and a Full-length Guide (3/16 inch). The Wahl Groomsman is a fairly decent trimmer, but it is easily the underdog among the other clippers reviewed here. It has its advantages such as the various different length guides and dual power usage. It is also ergonomically designed for comfortable use and it is light in weight. The travel lock feature is its differential to other standard clippers available in the market. Given its many advantages, it’s a more ideal beard trimmer than it is a hair clipper. With its long charge hold feature, it can prove to be an amazing travel partner. It is an all in one travel companion being small, compact and powerful with multiple features. The Wahl Groomsman is appropriately named as it is truly the ideal men’s grooming tool. 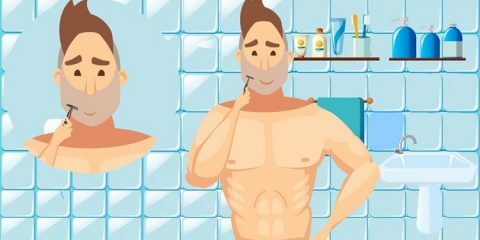 Regardless of its features, the Groomsman trimmer is not a good option for those with sensitive skin issues as it is prone to burns, bumps and ingrown hairs for facial & other body trimmings. Rotary motors are the conventional and most widely preferred motor type. Professionals over time have praised the power of rotary motors even though it is slower than newer alternatives. They are capable of cutting through all hair thicknesses and for both wet & dry hair. It is the classic choice of barbers and stylists. Magnetic motors are high speed motors which work best on normal hair types. It is cheaper than rotary motors and runs at a much faster speed. However, it is unable to replicate the power of rotary motors. Also, it is slightly louder than other motor types. Pivot motors are like a mid-option between rotary motors and magnetic motors. Pivots motors are not as fast as magnetic motors but are definitely capable of providing more power. They are least likely to overheat and are cheaper than rotary motors. After the motors, the blades are the next important factor. Regardless of how good a motor may be, a clipper will need the right blades to get the perfect cut. While there are many factors to consider about a motor, the blades are much simpler requirement. Blades are required to be strong and sharp for good cutting. Most of the best blades available in the market are made of stainless steel. It is always best to go for clippers with self-sharpening blades feature. It ensures that your blades will be sharper for longer and you won’t need replacement blades as often. We often overlook the main objective of our purchase. Regardless of the price, quality and features in a clipper, you must always ask yourself what the purpose or the use of the clippers is for you. So, remind yourself if you are buying a clipper for cutting your kids hair, your own hair, for professional use, or for regular personal grooming. Asking yourself these questions will re-establish the purpose of the clippers and allow you to make the best decision for your budget. Corded or cordless? It is one of the deciding factors of choosing a hair clipper. But this is becoming less of an issue every day with more and more manufacturers offering a fantastic battery life for clippers and dual usability as corded or cordless. Yes, the battery life of newer hair clippers are a massive improvement from a few years ago. The introduction of fast charging has also eased the pressure for cordless hair clippers. Many models also provide corded usage for emergencies. So, with a cord or without a cord, is not as crucial a factor as it used to be for most clippers available in the market today. Accessories that come with a hair clipper enhance the value of it to users. The variety of add-on clips, blade guards, etc. make it easier for you to style, trim and clip not only your hair, but also your facial hair and personal body grooming. Comb attachments are most common and the quality of these accessories are a deciding factor for most consumers. Although you can purchase separate accessories, the original combs, guards, etc. that come with a clipper set fine tune the complete clipping experience for users. With quality accessories, any clipper can create a special fondness among consumers. The decision to buy the best cheap hair clipper is not a stingy one, rather a smart one! It is challenging to pick a hair clipper in any case, but finding the most appropriate one within a budget can prove to be even more difficult. 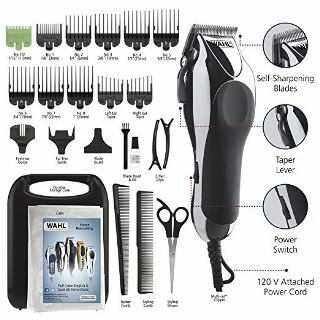 But with the reviews of some of the most affordable hair clippers in the market that were thoroughly discussed today, it will certainly become much easier for you. Not only are quality and price an issue, but also other things like ease of use, comfort, durability accessories, power source are all important aspects of the decision to buy the best hair clipper. As a professional or an amateur, the perfect haircut cannot be achieved without the right tool and the right tool is not right, until the price is right! We hope you enjoyed reading about all the best hair clippers that were thoroughly reviewed in this article. Which one will you choose as best for professional or home use? 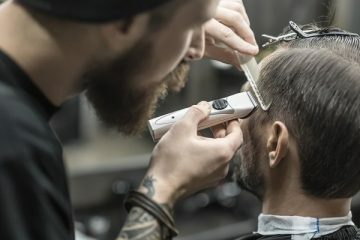 Before you dig deep into your pockets for a good hair clipper, pick one from this list and make some smart savings on your budget by buying the cheap hair clipper.